Yesterday’s altcoins price movement is a normal occurrence often happening after periods of rapid gains/losses. Stellar Lumens is leading the charge. On the other end though, EOS, Litecoin, Tron and IOTA are relatively flat and retracing. Regardless, we still remain upbeat expecting fundamental events to stimulate the next wave of buy pressure. Scalability is one area that EOS is excelling at. Before their mainnet launch, it was one of their main agenda. That’s apart from offering free transactions and simplifying this whole blockchain thing. In line with their objective, yesterday we saw their TPS spiking to 2822 surpassing that of Visa—which processes transactions at 2,000 TPS but capable of much more. This is definitely a new high coming straight from a blockchain project and reflects the cumulative efforts from the community and the team behind EOSIO. At this rate, EOSIO is open for even higher TPS all thanks to the 21 super nodes allowing for speed. At the charts, EOS is stagnant and even if it is down four percent in the last day, we still hold on a bullish skew for obvious reasons. Well, as long as price action oscillates inside July 17 high low we expect buyers to be in charge and drive prices above $9 our buy trigger line. Before then, we shall be neutral and trading in line with our laid out trade plan. A few days after flappening, Litecoin is in risk of dropping to position eight in the liquidity list. Its market cap is only $700 million away from that of Cardano’s at $7 billion. Anyhow, from the way charts are set up, there is more room for further gains especially now that we are net bullish after yesterday’s up-thrust above $90, our main bull trigger line. The thing is, despite yesterdays slow down and low level consolidation, LTC prices are still trending within July 17 candlestick supporting our assertions. In any case, my recommendation is to load at current prices with stops at $80 or July 17 lows. Alternatively, conservatives can wait for strong close above $90 before initiating buys with stops at $80 and targets at $110 as before. In the past week, Stellar Lumens has been a resilient if not an interesting pair to trade. Yes, it’s likely that we shall have a damping effect going on to the week as price action and traders in particular respond to the explosion of prices mid week but that is normal. That is a characteristic feature following this kind of explosions. Now, the deal is, XLM might retrace slightly and in that regard I suggest setting buy limits anywhere between 25 cents and 30 cents with immediate targets at 50 cents. In any case, and considering the break above at 22 cents, that’s where we should set up our stop loss. After deliberation, Justin Sun is expressing his interest and wants to run as a SR candidate. To be clear, this is going to be a personal decision and neither would be the 33.25 billion TRX coins under Tron Foundation escrow would be used to influence voting in any way. Of course, it’s going to be interested and in the spirit of governance and demonstration of how the system works, let’s see if he shall wade of competition and be slotted as one of the 27 SR.
Price wise though and we have this mid range Evening star complete with a bear pin bar right at 4 cents. From our analysis, our ideal long would be triggered if TRX buyers edge and close above 4 cents. If not, then we shall take a neutral stand expecting bears to drive prices towards 2.5 cents as before. However, considering the general positivity, taking a neutral position would be better as we wait for buyers to drive prices above this minor resistance line triggering longs in line with our other trade plan. This might happen either today or the weekend and at worse, next week. However, this condition applies only as long as prices are within July 17 high low. So far, IOTA is down seven percent and in the process it appears as if sellers are rejecting any gains above July highs. In that case, it remains obvious that we shall remain neutral as IOTA continues with this consolidation. 90 cents remain our anchor price tag and movement above $1.3 open doors for upsides. Without any movement in either direction, we remain neutral. 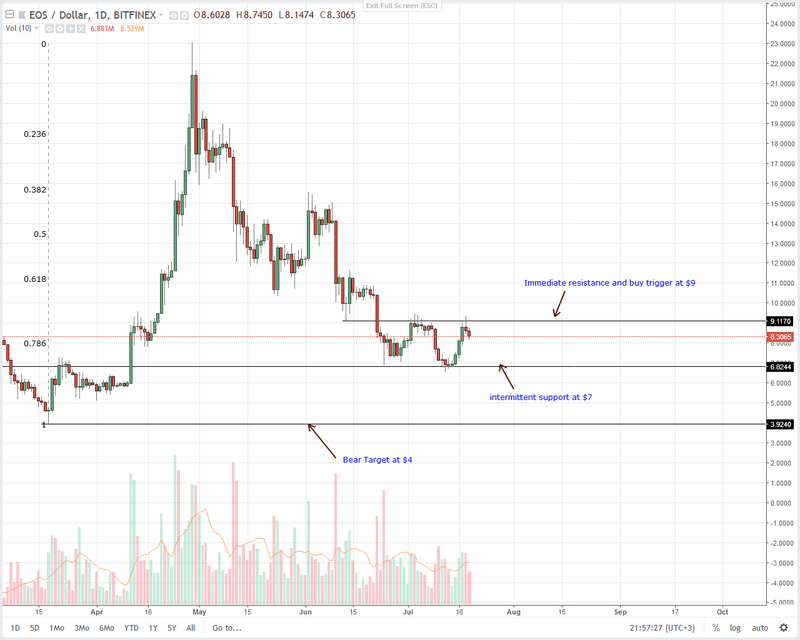 The post EOS, Stellar Lumens, IOTA, Litecoin, Tron Technical Analysis: Litecoin (LTC) is $700 Million Away From Dropping to 8th appeared first on NewsBTC. The Next-Gen Blockchain-Based Game CryptoBots: Idle launched Their Pre-Sale! This Wall Street Analyst Forecast Tesla’s Dominance. Here’s What He Says Will Shake up the Auto Industry Next.